I'm using TortoiseSVN against the SourceForge SVN repository. I'd like to move a file from one folder to another in order to maintain its revision history. Is this possible? If so, how do you do it? Subversion has native support for moving files. See the online help (svn help move) for more information. Check out section 5.14.2. Moving files and folders (or check out "move" in the Index of the help) of the TortoiseSVN help. You do a move via right-dragging. It also mentions that you need to commit from the parent folder to make it "one" revision. This works for doing the change in a working copy. You can also do the move via the Repo Browser (section 5.23. The Repository Browser of the help). With TortoiseSVN I just move the file on disk. This means I can let my IDE move round files and use it refactoring tools without losing history. In TortoiseSVN right click somewhere and go TortoiseSVN > Repo Browser open the repository. All you then have to do is drag and drop the file from one folder to the where you want it. It'll ask you to add a commit message and it defaults it to "Moved file/folder remotely"
Using TortoiseSVN I just right-click and drag the folder from one location to another. 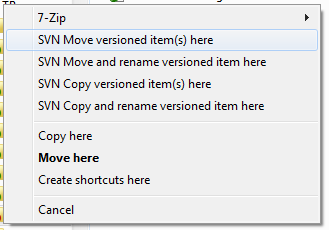 When you release the right-click you'll have the option to "SVN Move Version File." However, I believe that SVN doesn't do anything "fancy" there, but simply deletes the file in the previous location and Adds it to the new location. After you click the above the commit window message box will appear. Enter a message and submit. 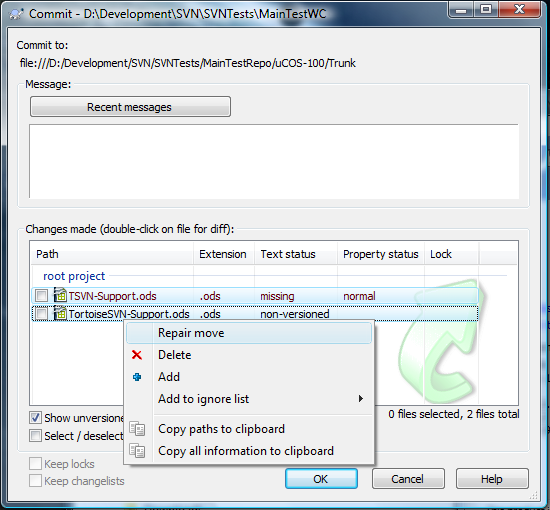 Cut file via operating system context menu as you usually do, then instead of doing regular paste, right click to bring context menu, then choose TortoiseSVN -> Paste (make sure you commit from root to include both old and new files in the commit). i think in the svn browser in tortoisesvn you can just drag it from one place to another. Since you're using Tortoise you may want to check out this link on LosTechies. It should be almost exactly what you are looking for. May also be called, "rename" by tortoise, but svn move, is the command in the barebones svn client. If I'm not wrong starting from version 1.5 SVN can track moved files\folders. In TortoiseSVN use can move file via drag&drop. If you are moving folders via Repository Browser, then there is no Move option on right-click; the only way is to drag and drop. How do I relocate my Android project in SVN? Is it possible to keep history of code moves between files in SVN? How Does SVN Mark A File As A Copy/Move? How do I move a file (or folder) from one folder to another in TortoiseSVN? What is the correct way to restore a deleted file from SVN? How can I delete all unversioned/ignored files/folders in my working copy?